Hi-Fi buffs may already be familiar with Tannoy's Definition speakers, a two-channel range first introduced way back in the mid-'90s and brought back to life in 2009 with an elegant new design for the contemporary market. That's the very same system you're currently ogling here. 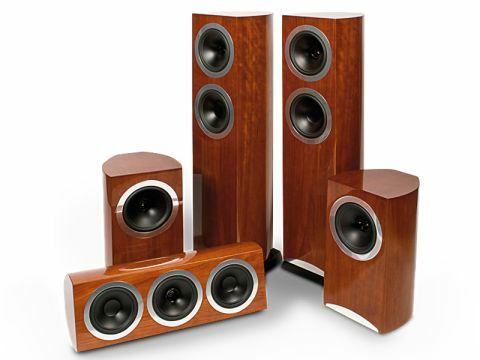 Despite being conceived as a two-channel range with a choice of two floorstanders (DC10T / DC8T) and a standmount speaker (DC8), dealers were installing them as multichannel systems for punters who recognised the home cinema potential of these dynamic speakers. But having a whacking great tower speaker on movie dialogue duties is far from ideal, so naturally, buyers started clamouring for a dedicated centre that they could tuck under their TV in a proper surround setup. Enter the DC6 LCR, a brand-new centre designed to add a bit of specialist speech-handling to the Definition lineup. In the system here, this newcomer joins a pair of DC8Ts on front channel duties and a pair of DC8s for the rears, completing a formidable-looking, but megapricey 5.0 setup. 'But what of the subwoofer?' I hear you cry. Well, a 1,000W Definition subwoofer with twin opposing drivers is currently in the design stage. Definition is certainly not a budget range, then, with a pair of DC8Ts costing £4,200, DC8s at £2,500 a pair and the DC6 LCR at £1,500, but the beautiful build quality is exactly what you'd expect for that price. The construction of the DC8Ts is rock-solid, but their clean, elegant lines and lustrous cherry finish (also available in walnut or black) is totally seductive. Underneath the surface glamour, the cabinets are constructed from top-quality birch plywood, which improves the acoustic properties of the laminate. You also get magnetic grilles that attach without any fixings to compromise the look or acoustic integrity of the design. It's that sort of attention to detail that not only helps explain the bank-busting price, but also leaves me in a state of complete weak-kneed deference when in their presence. Much the same can be said for the DC8s and DC6 LCR, which share the flawless craftsmanship and classy styling. And with this audio tech Tannoy is really spoiling us – each speaker features Dual Concentric drivers, which places a 1-inch Tulip WaveGuide tweeter within the 'throat' of the mid/bass driver, allowing sounds to emanate from a single point source and thereby improve the imaging sweet spot. These DC drivers (8-inch for the DC8Ts, 10-inch for the DC10Ts) are made from a treated paper pulp cone with a rubber surround. The DC8 bookshelf speakers sport one of these drivers, but in the DC8T it's backed up by another 8-inch bass-only driver positioned below. Without the grilles, the large drivers dominate the front of each speaker, but the silver ring around each one is an alluring touch. Their Wideband technology not only delivers thumping low-end down to around 33Hz, but also enables them to resolve the finer details of movie soundtracks and music with an upper frequency response of 35kHz. As for the DC6 LCR, it features a new 6-inch version of the Dual Concentric driver flanked by a similarly-sized bass driver and passive radiator to give speech the depth and authority it requires, as well as matching the drive of the other speakers. This sealed cabinet/passive radiator combo is used instead of the other speakers' rear-ported design because it's more practical when installing it close to a TV or against a wall. I was worried that Definition's music-centric origins might result in a neutral sound that doesn't get the adrenalin pumping when presented with movie material. Not a chance – it's as well equipped for the rigours of a blockbuster movie as a pureblood home cinema system. With Avatar and Iron Man 2 up and running, I was hit by a sonic tsunami of considerable power, boundless energy and meticulous detail. As a whole, it's wildly entertaining yet goes about its business with all the refinement and maturity you'd expect from such pricey speakers. There's a remarkable scale and spine-tingling dynamism about Avatar's action scenes, particularly the Battle For Pandora where the wide open soundstage is populated by thunderous explosions, scarily realistic gun shots and roaring engines that rattle right through you. While controlled, it doesn't compromise on excitement, and when pushed hard at loud volumes, it maintains composure and clarity no matter how frenetic the scene. Remarkably, the system's bass performance is excellent even without the assistance of a subwoofer. Bottom-end effects are thick and punchy, lending just enough weight and depth to every scene. That said, it did definitely benefit from having a sub underpinning the action, and it will be fascinating to hear how the eventual Definition sub slots into this already impressive package. Detail reproduction meanwhile is out of this world. During the above scene, I was able to discern parts of the soundtrack that normally get buried on inferior systems, such as the flick of guitar strings being strummed in the movie's score. Even the faintest brush of jungle undergrowth or flap of wings is reproduced so realistically it feels as if it's happening right there. This excellent detail handling comes into its own during Avatar's more tender moments. The background for Jake and Neytiri's 'consummation' in the forest is an absorbing tapestry of fluttering insects, whispering voices and the faint sound of running water. The way these sounds are coaxed and caressed by the Definition speakers is mesmerising, stirring the emotions is a way that moving computer pixels have no right to. The DC6 LCR proves itself to be an articulate performer, conveying dialogue with amazing clarity. Quaritch's voice came through loud and clear on board the helicopter as the blades noisily whirr above. And Jake's rallying cry to the Na'vi hordes, is suitably prominent, backed by licks of echo from the rear speakers. Given its musical background, it comes as no surprise to learn that the Definition system works well with multichannel DVD-Audio and Blu-ray discs, too. The depth, sparkling detail and vocal purity is truly wondrous, making this a formidable proposition for music and movie lovers alike – a matching sub will be the icing on the cake.